After experiencing the sensuous contours of Dupont, was it a letdown to return to the crisp vistas of a Bloor-line station? Dupont is an architectural flight of fancy, whereas Runnymede hearkens back to a methodical attitude of workhorse functionality and standardized purpose. Each has its proper place in time, and I’m thankful both are with us to enjoy. Runnymede’s as-yet-still-functioning, old-school illuminated signage on the Kennedy side continues to beckon weary travellers. Beyond, the repeating barrel-vaulted ceiling of the bus platform is not without its charms. Clean lines, if not entirely clean. That blue has punch! 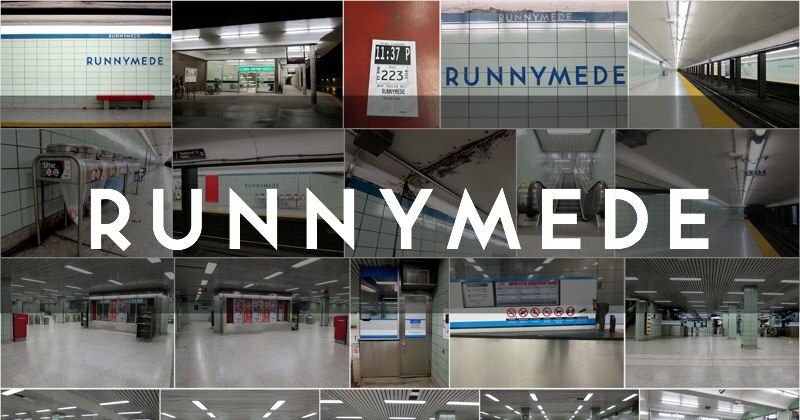 Runnymede meshes in perfectly with its modest role servicing the eastern end of Bloor West Village. The station name references the 1838 house/estate of landowner John Scarlett, which in turn was named for the meadow where the Magna Carta was signed. The station opened in 1968, part of the welcome extension of the Bloor line to Islington (from Keele). If you’re in the area, be sure to stop by the beautiful Runnymede branch of the Toronto Public Library, a block east.